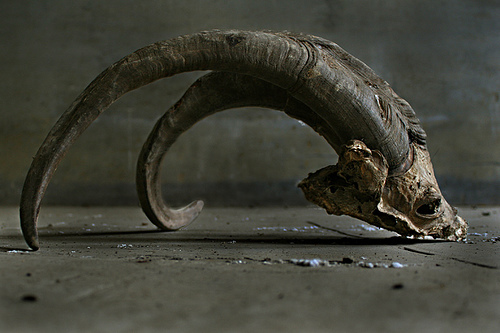 SCP-517's skull after encounter with SCP-076. Note structural similarity to [REDACTED]. Special Containment Procedures: SCP-517's containment is fairly straightforward. It will be content in a plain rectangular chamber, so long as chamber is at least 25m x 25m x 10m. Walls, ceiling, and floor are to be reinforced with steel plate at least 14 cm thick, and two heavy machine gun emplacements must be trained on the creature continuously. Any significantly anomalous behavior is to be met with sustained machine gun fire, which is to continue until SCP-517 is unconscious. The creature will become agitated and begin to damage its container if it is not given at least 60 kg fresh meat daily. It is not affected by dehydration, hypoxia, temperature extremes, insomnia, electrical current, or any known toxin or biological agent. It can be subdued only by massive cranial trauma or blood loss, and then only temporarily. It is strongly advised that all dealings with SCP-517 be automated so as to avoid further casualties, which have been considerable to date. Under no circumstances are personnel to enter the container, with the exception of D-level personnel. Description: SCP-517 is a large, carnivorous, bipedal animal of indeterminate origin, roughly 4.5 m in height and weighing approximately 600 kg. Its appearance is a hybrid of several mammalian species. The creature has four long, apelike arms, one pair behind the other. All digits have retractable claws some 8cm in length. The legs appear mostly ursine. The creature has a long muscular tail, which is generally used for balance while walking. The head is vaguely feline, with powerful jaws and large, forward-set eyes, although it also sports two gazelle-like horns. The creature's entire body is covered in sleek black fur, which has exhibited significant flame-retardant properties. SCP-517 is extremely dangerous due to its great speed, strength, plethora of natural weapons and extraordinary resistance to injury. It will attack every living organism in sight in a seemingly mindless rage. This berserk state, however, is not without strategy; the creature can instantly incorporate any available weapon into its tactics, suggesting either high intelligence or an instinctual understanding of the dynamics of combat and prompting serious questions about its origins. When not engaged in feeding or combat, SCP-517 will either sit quietly or pace slowly within its container as if waiting for further violent diversion. The earliest record of SCP-517's existence is an incident in which the creature slaughtered and consumed the better part of a small town in [DATA EXPUNGED] over the course of several weeks. The creature was subdued and captured after being shot eight times with an XM500 Barrett .50 caliber rifle. The final shot was the only one observed to have any real effect, impacting the base of the skull and putting the creature into a shallow coma. The creature's unconsciousness lasted longer than the wounds themselves, which healed completely in a matter of minutes. The creature apparently suffered no permanent loss of brain function from this injury. Current research is focused primarily on duplicating SCP-517's abilities, as it is unlikely that we will ever be able to truly control the beast. It has come to my attention that several Level 2 staff members have been attempting to organize what can only be called a "fight club". Specifically, copies of an office pool taking bets on a theoretical "death match" between SCP-517 and SCP-682 have found their way to my inbox; further matches have also been proposed in these documents, at least one of which would presumably involve SCP-847. Unauthorized use of any SCP item for monetary gain is strictly prohibited, especially in respect to gambling. All staff involved with this infraction have been reduced to security class D. Further infractions will be met with increasingly severe reprimands. SCP-076 was allowed entry into SCP-517's containment chamber. Please see Addendum 076-06.